"Divination is to clear doubt, why bother if there is none?" Ever making any decisions in your life? Every day. Would they make you superstitious? Not really, especially when you understand this Chinese wisdom. Divination is simply a second opinion. What is doubt? There exist doubt when people said otherwise. Why bother is not just a reflection of your mental state, but your readiness of taking on challenge. Chinese people have developed and been practicing a specialized divination technique using hexagrams to clear doubt thousands of years ago. The hexagrams are the early binary presentation in a set of 6-parallel-line symbols first introduced in “Yi-Jing” 《易經》, the book of divination as described by ancient historians. Since then, Wen-Wang Gua 文王卦 has evolved and become popular since the Song Dynasty 宋朝 (960CE to 1279CE). People find it incredibly amazing in its ability to predict and yet wonder how it works. "The Secret of Wen-Wang Gua", draws on the expertise of an author who is a successful practitioner of Chinese Metaphysics, reveals this divination secrets and takes you to master this ancient Chinese wisdom step by step in the most logical and explainable approaches. A basic introduction of Wen-Wang Gua – what is it and where did it come from. Supplemented with the basic of “Yi” and how it relates to the law of universe. Included also an astonishing interpretation of “Zhou-Yi” using the concept of Seasonal Strength of Ba-gua. Casting is what you need as a first step of finding the representing hexagram for a meaningful divination. This chapter walks you through the process and gives you the details of how it works. A step-by-step approach which walks you through the complexity of Setting – being the second step of a meaningful divination. The Eight Chamber Theory, the Adoption of Earthly Branches, the Six Relatives, the mounting of the Six Celestial Figures. All that you need to ensure a right Setting. 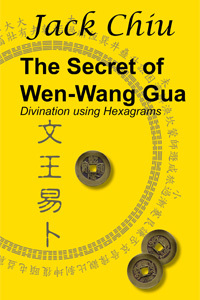 Deciphering unveils the back engine of Wen-Wang Gua – the final step of a meaningful and powerful divination. Revealing the interaction of every change with a set of consistent and repeatable rules and guidelines. Demonstrates with real life examples of using Wen-Wang Gua covering different aspects of life. Explains in details how the deciphering rules are applied. This book is written for those who do not have any prior knowledge of Wen-Wang Gua, and even any other Chinese Metaphysics. Part IV: Deciphering and Part V: Wen-Wang Gua in Real Life are specially written for those who had learned but confused of how Wen-Wang Gua works. I have read this book and I can highly recommend it. I’ve been looking for other WWG books since a long time, but found none apart from this here. Fortunately this here is complete and very well. The book was published in March 2010 and it is exactly the book I was waited for. Jack Chiu did a very good job here because he wasn’t too lazy to write it all in pinyin, in Chinese and in English. So this is probably the book all WWG interested people have been waited for. Of course he also explains how to adapt it all to the lines and the hexagrams and he explains all the relationships and effects of all forces among each other and so it is actually a book which teaches WWG entirely, because everybody can learn it by reading this book. It is complete. Nothing is missing and the only thing one has to do is to learn, to understand and to practice. Also the rules are explained in a way everybody is able to understand easily!!! Apart from that he also gives us a lot of information about the Yijing (Zhou Yi/周易) in general, he explains all very detailed and even the ones of you who are dealing with the Yijing since a longer time will probably get some new and/or additional information from this book. He also reports about historical persons who were connected with the Yijing and WWG and you get a lot of detailed historical information concerning the Yijing in addition. For making it perfect he gives us a lot of graphics, tables and drawings for to help us understanding all as easy as possible and for having great overviews when it comes to the part of six line analysis. Many, many thanks to Jack Chiu for this great and helpful book and many thanks to all others who helped him and make this project possible. As an inquisitive WWG student I would wish a complete rules collection of all ancient and valid rules. There seem to be more than the ones which are written down in the book already. Probably we got the main rules or most important rules here and probably it is enough for to answer the most questions, but I wish to learn as much as possible about WWG and so I hope that Jack Chiu will go on writing such good books in English too. Well, I am a very recent fan of weng-wang, My first contact was with Raymond Lo's book and the second was our friend's Jack's. Jack, I have to congratulate you on the excellent work you have done. I consider it as a masterjob, because, although addressed mainly to english speaking people you lead your reader step by step in understanding the whole procedure, I liked the ancient quotations translated into english. Besides I found quite enough answers to some of my questions in common use with the four pillars Like the Five Tigers chasing the year, "The Rats chasing the hour " etc etc I have but to give you my warmest congratulations. So I tried to put things into practice. As a beginner of course I followed all the steps one by one browsing the pages of the book and amazing the results were immediate. The first was the match between Greece and Argentina for the world cup in S.Africa. It was predicted that the winner would be Argentina, although I knew the hour of the game I did not know how to use it because it has not been reffered neither to Lo's book nor to yours. Is rather that David wants to exceed it and experiment further using the hour as well. Moreover I had to ask three different questions for my son, in relation with his job and again I had the answers exactly as the facts happened a few days later. And having in mind that i didn't make any use of the celestial animals or the guas, as i am not familiar yet I am really enthusiastic and of course Now i begin to work more and more with Weng-Wang Gua.